love. lust. butterflies. | A blog about the things I love, written by a hopeful romantic. My new blog design went live last week and I’m working on transferring the nearly 300 subscribers to the new site but I think it will take a little bit of time and in the meantime you are missing some really great posts! Please head over to the new and improved love. lust butterflies. site and click on the “SUBSCRIBE” form and sign up again with your email so that you don’t miss any of the action! And, don’t forget you can follow me on facebook, Twitter, Pinterest and Instagram too! Thank you so much for reading and following my blog, I really appreciate it! Happy, Happy 4oth Birthday Valerie Russo! How in the heck did we get to be in our 40’s already? 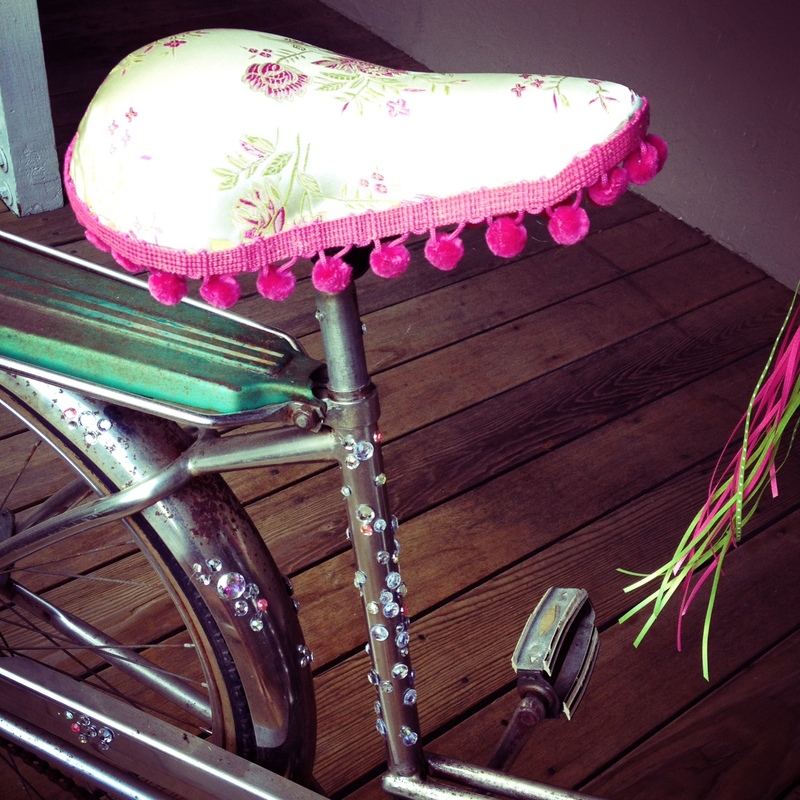 One of my fondest memories of us as kids is riding you around our neighborhood on my banana seat bike! I’ve been prepping in a craze for my week on the playa that begins today and many friends have wished me well and expressed that they cannot wait to see my updates from Black Rock City. Sorry to disappoint, but I’m taking the whole week to completely unplug myself from all of the stuff that I’m normally (very) plugged into. Like many, I tweet, I have facebook pages (both personally and for this blog), I capture every drink, new boutique find and yummy lunch on my Instagram profile and I pin things to my Pinterest boards… Some of this I do in the name of marketing, but most of it I do in the name of me. As my dearest friend Bari pointed out when I told her that I was giving myself this gift of unplugging for a week, taking photographs and chronicling my surroundings – and writing about it – is the way I move in the world, how I digest and process things I see, love, am moved by, etc. I assured her that I was going to do a bit of this; I am brining a camera and a journal but I won’t be sharing any of it live. And, I definitely won’t be online or concerned about AT&T’s horrible cell reception. A whole week of being completely unplugged. A cleanse. A gift. A reboot. I’ve never done this in my life. I need it now more than ever and I look forward to my re-entry with a renewed perspective, leaning on the experience of how it felt to be in the silence. Just being. Thanks to the marvels of WordPress I’m writing this ahead of time and scheduling it to post; as you read it I will be on my way to the playa giggling with my playa playmate at the list we have PRINTED OUT (from Kate’s app) for our week of being completely unplugged! Wishing you lots of love, lust, butterflies…and quiet unplugged time this week! Remember this? 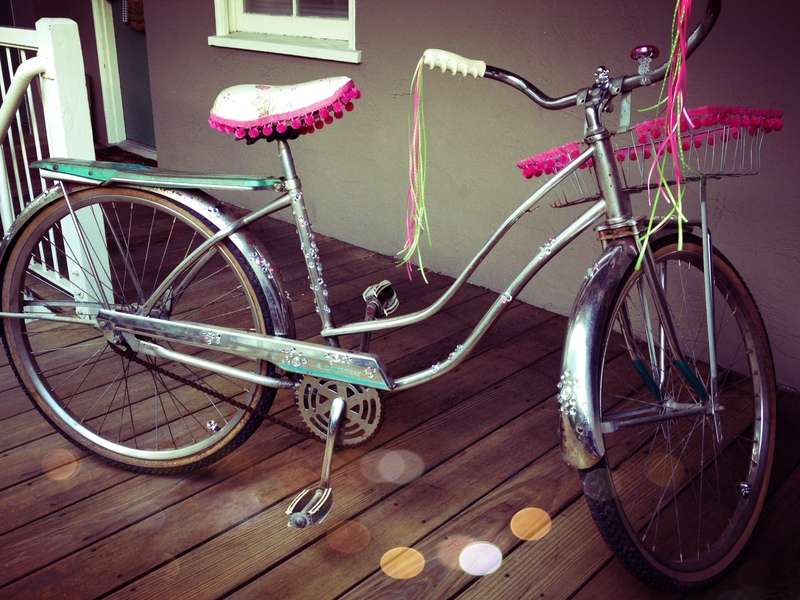 My vintage Hawthorne cruiser from the Alameda Flea Market the first Sunday of the month? 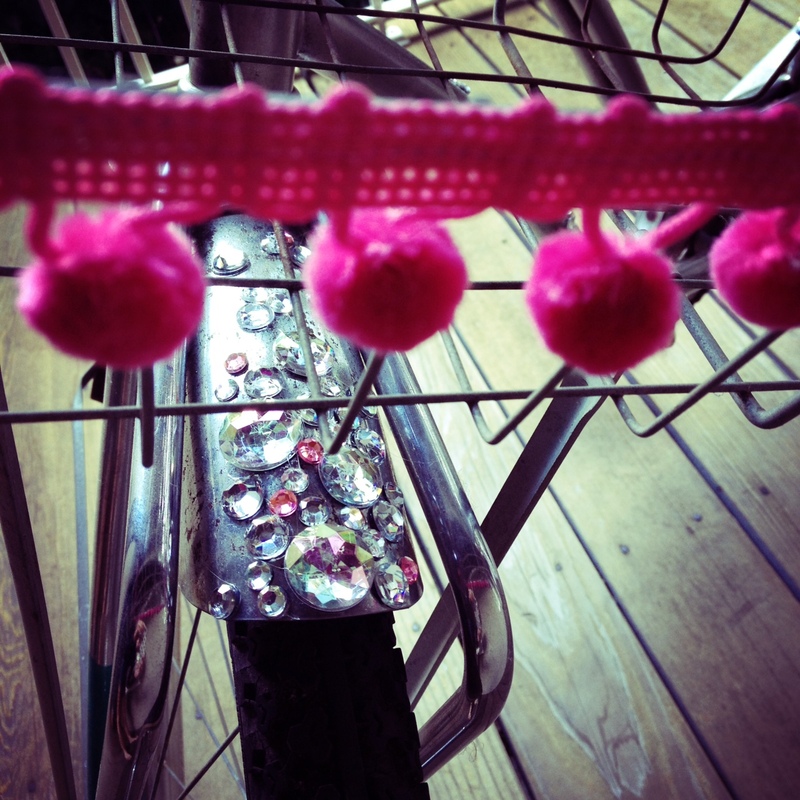 The newest addition to my bike collection got a facelift today, just in time for playa lift-off on Monday morning! I spent a lot of time in JoAnn Fabrics yesterday, I knew I wanted to cover the old seat and I maybe should have done something more practical but that’s almost never the case with me. I fell in-love with this pink and green brocade fabric and the matching pink tassels. And the very first thing I was certain about was that the frame had to be “bling-ed.” Instead of encrusting the entire thing (which mostly had to do with my hot glued finger tips and lack of time) I picked spots to highlight with various shaped and colored bling, throwing in a matching pink sparkle here and there. I created the ribbon streamers with tiny ribbons and a quick knot – these remind me of the real ones I had on my very first bike as a kid! 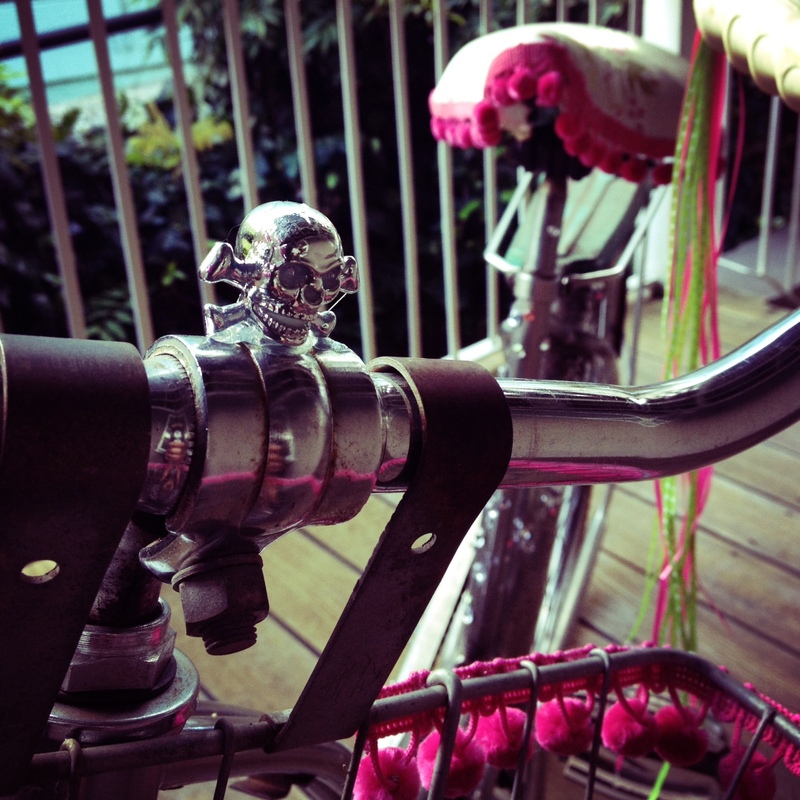 One thing I did not have on my childhood bike but that I had to have on this one is skulls, lots of blingy skulls! 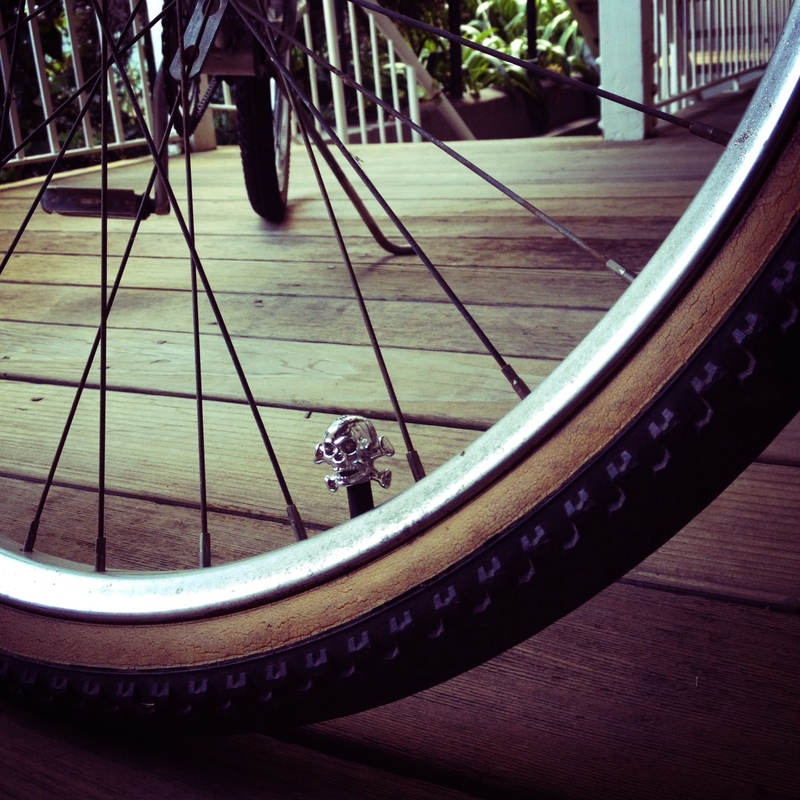 I hot glued one on the handlebars for sure and then picked up a few for the tire valves at Mike’s Bikes in Sausalito. 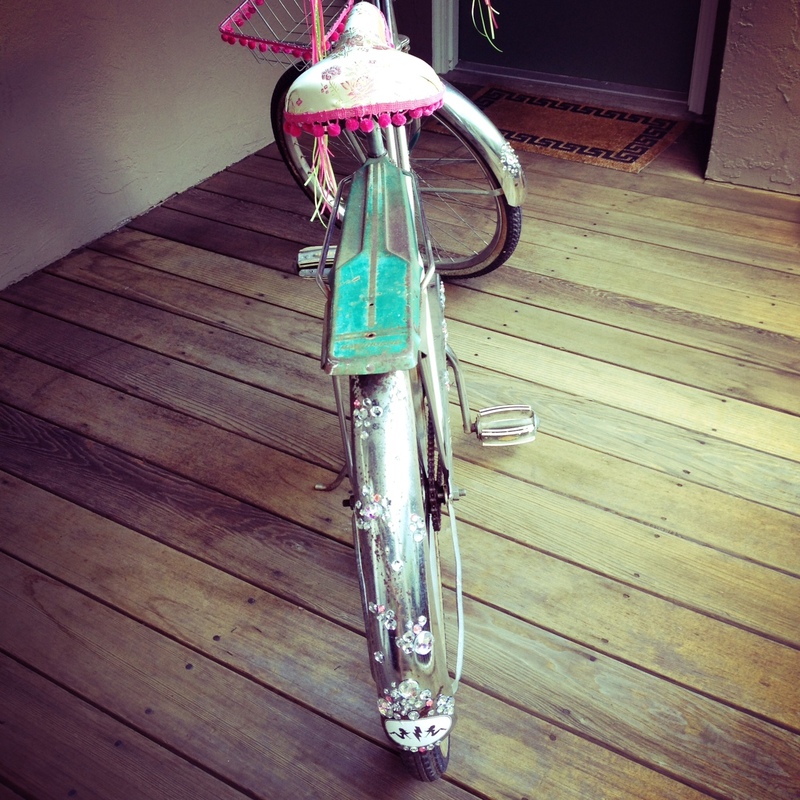 Of course I have the Divine Electric mudflap girl sticker on the back; I added a little bit of bling to it and I think my new playa cruiser is ready to go! I fell hard, madly in-love today with this beautiful playa image by Peter Ruprecht, taken at Burning Man a few years ago. Okay, instantly it was the wedding planner in me and then the hopeless romantic girlie kicked in a little…and I’M GOING! I want a cutie pic of me and my partner in crime, capturing that we are over the moon about each other and feeling happy and free. We leave for the playa on Monday and I just read this great article entitled “The Misconceptions of Burning Man,” by Mary Polizzotti of 7×7 Magazine this week which resonated with me because I’ve been sharing where my “vacation” is with my work peeps and others and while most people here know what Burning Man is I think there are many misconceptions. I cannot wait to be a citizen of Black Rock City this year, where we will be the only living creatures for miles and the sky is a big, beautiful desert sky that makes you feel small. Where we get back to the basics of love and giving thanks and freedom of expression is encouraged and appreciated. There is something magical about a city of love appearing out of nothing – and then vanishing a week later, like it was never there. 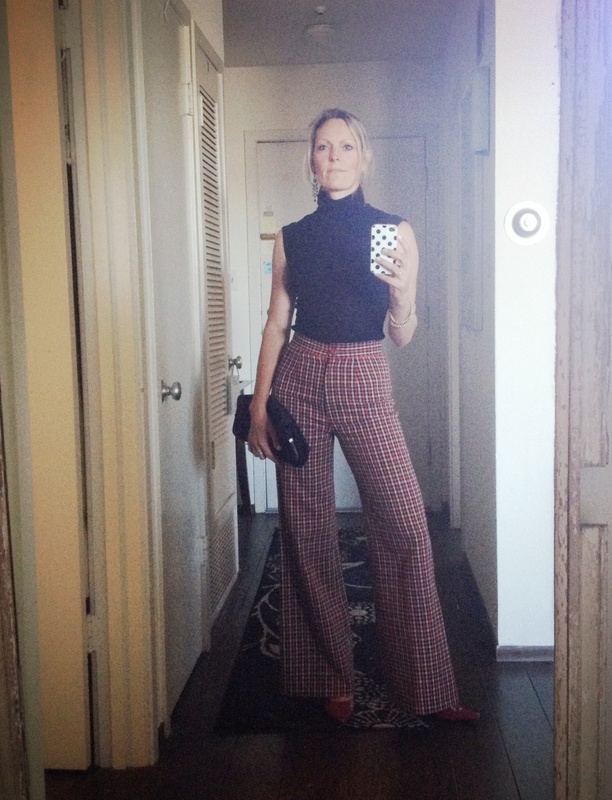 There’s a chill in the air, typical August weather in Northern California, and it’s alright with me because it means I can wear my high-waisted vintage wool plaid pants a little early. I wore them tonight with a black short sleeve turtleneck knit top and some red paten leather Nine West heels and my go-to sparkly black clutch from Gap. 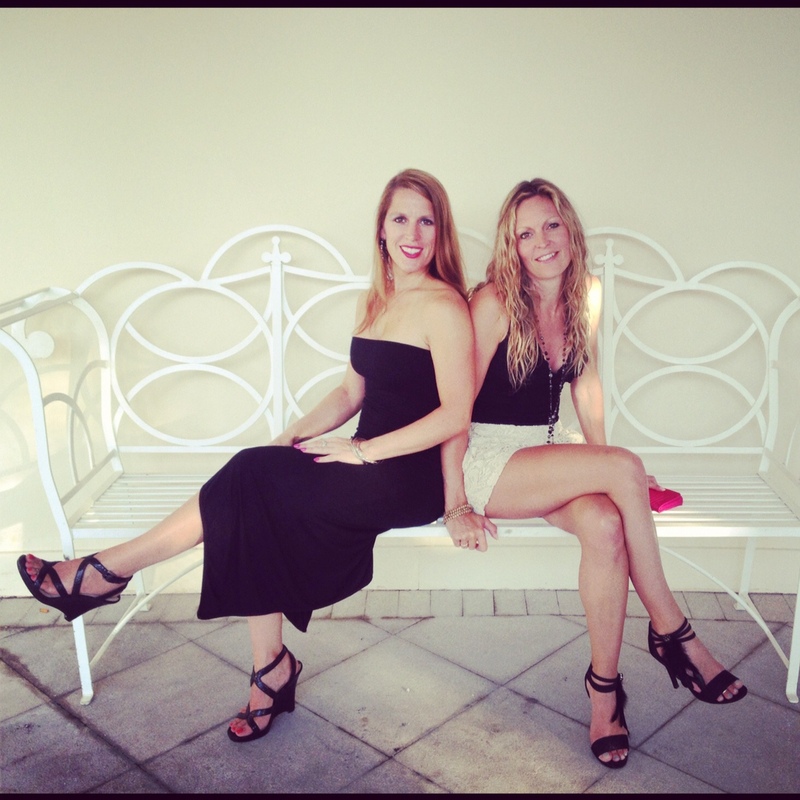 It was the perfect look for the 7×7 Fashion Issue Launch Party at Neiman Marcus in the city! I’ve been in-love with butterflies for a long, long time. My first business was called “social butterfly” and I had many “little butterflies” that helped me with my weddings and events each year. I have journals and cards with butterfly quotes on them and the transformation of the caterpillar to a butterfly resonates with me. 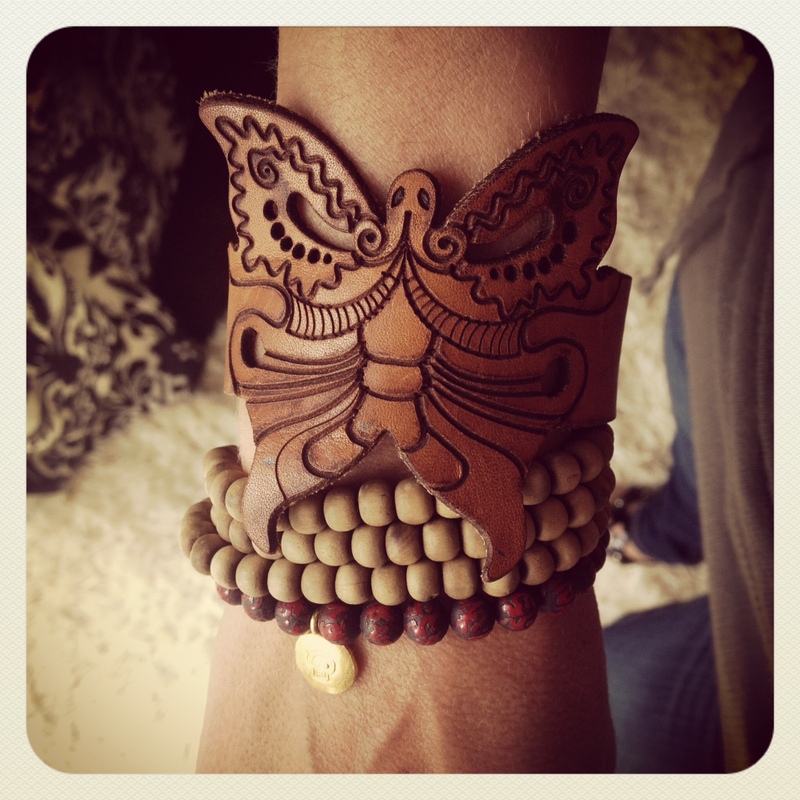 Today I’m crushing on one of my favorite butterfly bracelets made of leather. It goes perfectly with my mala and a special birthday bracelet I got from a friend a few years ago.